Freshly Renovated and Refurbished, This City Hotel Blends Style and Affordable Elegance in a Contemporary Setting. To Make For a Pleasurable and Relaxing Stay, the Establishment Comprises a Total of 112 Guest Rooms Equipped With Modern Creature Comforts, As Well As a Variety of Facilities All Under One Roof. 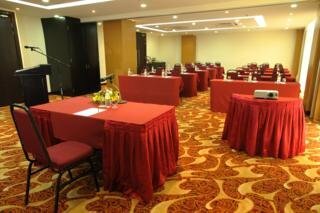 The Hotel Emanates All the Charm of True Malaccan Hospitality and is Fully Air-Conditioned. Guests Are Welcomed Into a Lobby With 24-Hour Reception and a Hotel Safe. On-Site Facilities Include Lift Access, a Restaurant, Conference Facilities, Wlan Internet Access and a Laundry Service. Guests Arriving by Car Can Leave Their Vehicles in the Nearby Car Park.